We're looking for a part-time Historic Presenter in the education department! Posting closes on Friday, March 8! Thank you to everyone for a wonderful 2018! 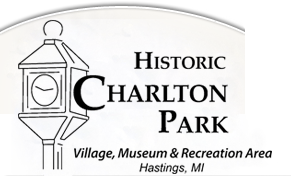 2018 was a great year for Historic Charlton Park. Thank you to everyone who visited the Park, whether it was for an education program, an event, or just to enjoy the village and museum. We appreciate all of your support! Don't hesitate to visit the grounds during the winter season, our trails are great for seeing the sights and sounds of a Michigan winter. We hope that you and your family have a wonderful holiday season, and we look forward to serving you in 2019. Park Gate open 8 a.m. to 8 p.m. daily. Business Office open 9 a.m. to 2 p.m. Monday-Friday. The Historic Village is closed. the basis of race, color, national origin, disability, or age in admission to, or participation in, any of its programs and activities.